Home Off Beat	Wi-Fi photo frame connected to Facebook: View pictures on the go! 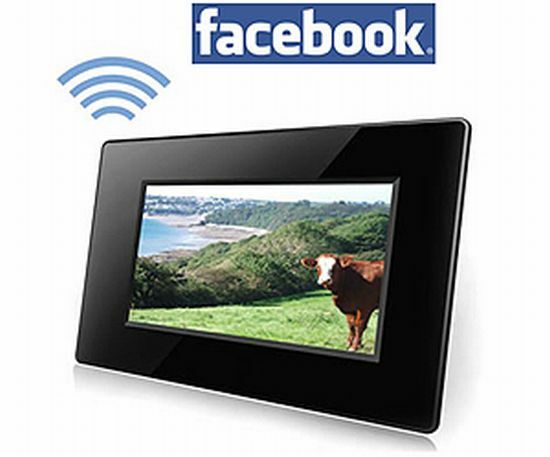 Wi-Fi photo frame connected to Facebook: View pictures on the go! Not too long back, photo-frames meant nothing more than a particular favorite moment captured in celluloid and put on the mantelpiece for years. It would have been surprising if photo-frames continued being only that, given the fact that there is hardly any sphere of life, hardly any product of use that technology hasnât touched, modified or metamorphosed beyond recognition. It looks like a regular simple 8â photo-frame with a thick black piano finish frame. But hey, donât go by its looks. Let me tell you what it does and see if you are not surprised. This WiFi frame from eStarling is connected to your Facebook profile. It recognizes your Facebook user name and password and delivers pictures to your frame as soon as they are posted by your Facebook friends, thanks to the built in Wi-Fi connection which supports WEP or WPA for the encryption. The screen configures the frame in DHCP or with a fixed IP address. Have your friends email you pictures (JPEG files) while you travel. Thus, you can âalmostâ be there at your friendâs birthday party you hated to miss or enjoy the âfirst lookâ of your baby niece âalmost liveâ with the rest of your family. The âintelligentâ photo frame will also take care to keep spam emails at bay. The 8â³ Widescreen features widescreen aspect ratio (800Ã600 resolution) and Innoloux panel ensures pictures of wonderful clarity. The 128 MB flash memory helps you carry all your favorite photos with you. This wonderful gadget also boasts of Wi-Fi 802.11b/g with support for WEP encryption, MMC/SD/MS/CF 4in1 card slot and external 120V/240V AC Adapter. Gift this to yourself or your best friend, anybody is going to love this. In case you donât have a Facebook account, get one fast. Itâs terribly easy and super fun. The pocket pinch for this photo frame would be Â£230 in the UK.